Raiders defensive end Khalil Mack (52) is a cornerstone of their roster and a vital cog in their current first place hold on the AFC West. 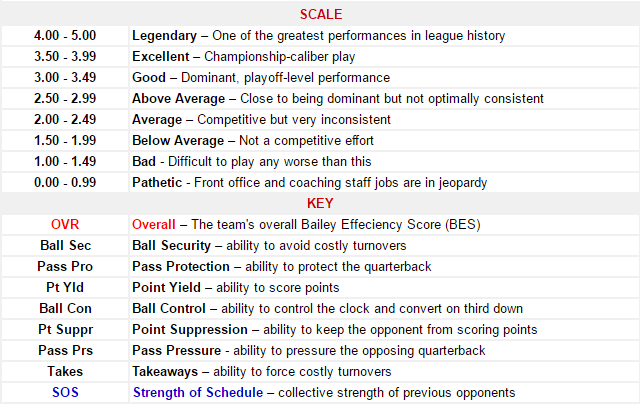 Week 12 was another accurate one for the BES as it went 12-4 (.750) based on our Week 11 report. That’s a mark of 22-8 (.733) over the last couple weeks. It’ll be interesting to see if that becomes the norm for the rest of the season. 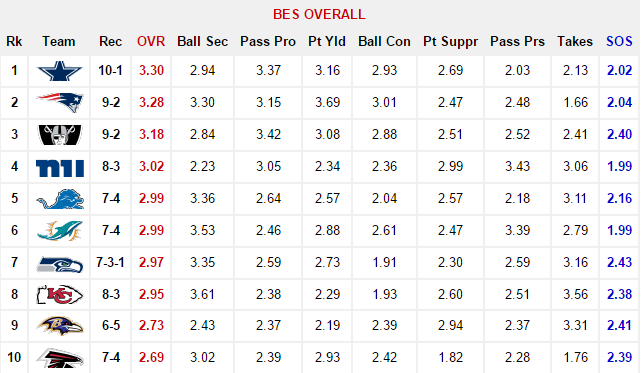 As for this week’s report, there’s been some shifting in the BES Top-10 with the Patriots (9-2) closing the gap between themselves and the Cowboys (10-1) as the two teams trend in different directions. The Cowboys saw a .03 decrease in their BES Overall score despite completing their divisional sweep of the Redskins (6-4-1) with a 31-26 win in Week 12. That decline is largely due to their No. 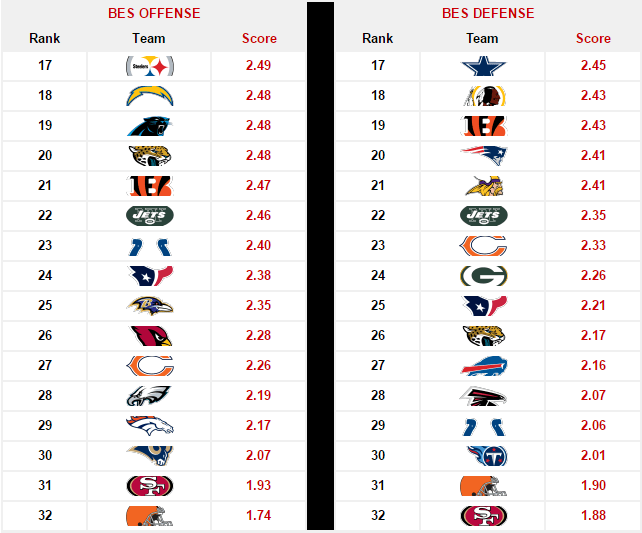 17-ranked BES defense allowing an average of 24.3 points over their last three games. That is an alarming trend as they get set to play three BES Top-15 teams over the next four weeks. The Cowboys will travel to confront the Giants (8-3) in Week 14 before returning home to host the Lions (7-4) and Buccaneers (6-5) in Weeks 15 and 16 respectively. The Buccaneers are especially dangerous after defeating a pair of BES Top-10 teams, the Chiefs (8-3) and Seahawks (7-3-1) in their last two outings. 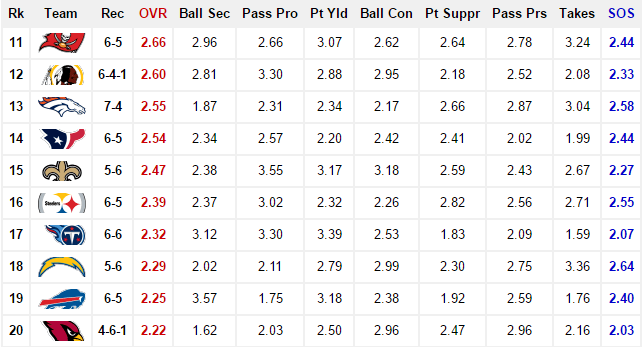 As for the Giants, they’ve cracked the top-5, landing at No. 4 in BES Overall this week. They currently enjoy a six-game winning streak that might be jeopardized when they go on the road to face the Steelers (6-5) in Week 13. Giants quarterback Eli Manning will lead the No. 15 BES Offense into that contest, having thrown 15 touchdowns against six interceptions in his last six games. Meanwhile, the Giants No. 1 BES Defense faces a potent Steelers offense averaging 27.3 points per game over the last three weeks. The Ravens (6-5) make a notable return to the top-10 this week after last appearing among the group in our Week 4 rankings. Having amassed three divisional wins in their last four games, the Ravens currently control the AFC North, defined by a 6th-ranked BES Defense that paces the NFL with just 74.9 rushing yards allowed per game. The unit, led in sacks (8) by 14-year veteran linebacker Terrell Suggs, also ranks second in total defense, permitting 297.8 yards per contest. 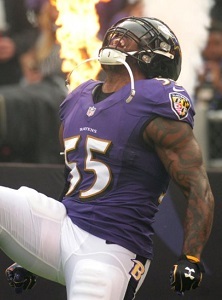 Suggs and Co. will have their work cut out for them against the Dolphins (7-4) in Week 13 and Patriots in Week 14. Yes, the Chiefs. Actually, it was #4. Do I not understand something? 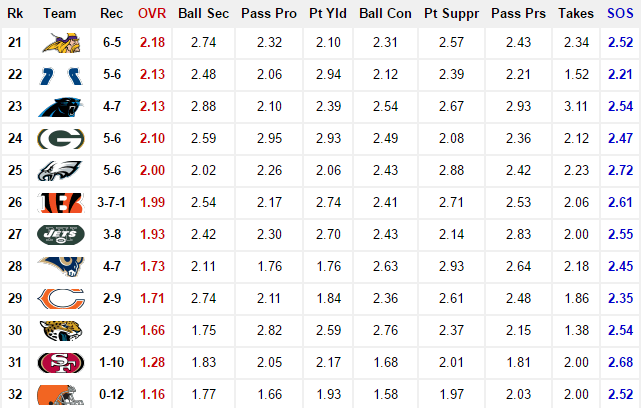 There is no way the Seahawks’ defense should be lower ranked than their offense. 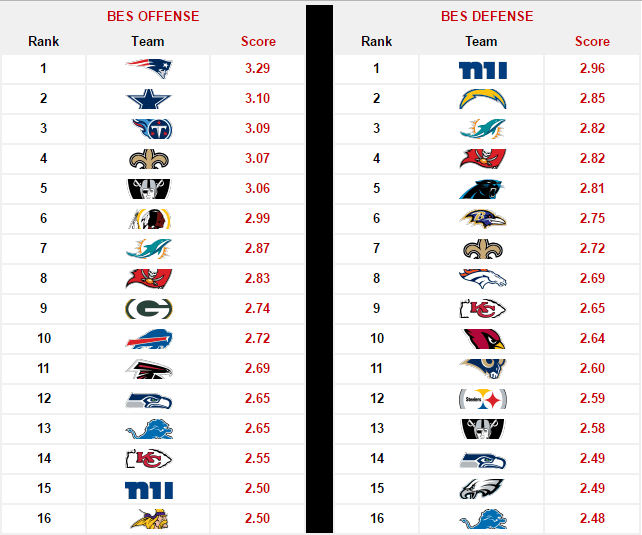 The defense is yet again #1 in scoring defense, allowing only 17 points per game on average despite playing quite a few of the top offenses. Even this defensively spoiled 12 has been amazed at how great the defense has been playing.